Of Holy Trinity Church: The original church was built by the Benedictine monks for their tenants. The oldest part is the 13th Century North Porch, although a Church stood here as early as 1113 and was destroyed by fire in 1257. 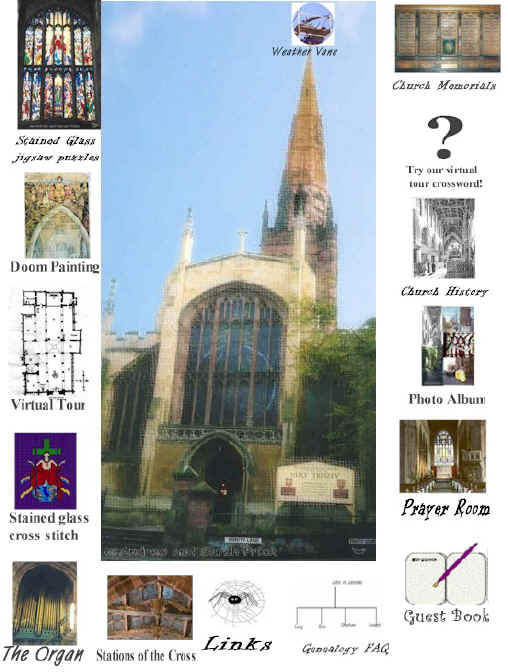 I, Sarah and my husband, Andrew, welcome you all to www.take-a-pew.org.uk, our informal and unofficial site on the history of Holy Trinity Church, Coventry. (Please read our caveat below) Simply hover your mouse over each of our different links on our image map below to find out what we have to offer and click to select. Each page will link to further pages with more on that topic. DO note that we do not represent the church in any way and this is very much a "fan site". We wish to extol our love of the church where we were both married, the church where my (Sarah) parents were married in, and the church where my father, brother and mother had their funerals and where their ashes are now interred in the churchyard.